Gen. Eric Shinseki (Ret.) will be Veterans Affairs secretary in the Obama administration. Retired Gen. Eric K. Shinseki, who clashed with the Bush administration on its Iraq war strategy, will bring qualities to the job of Veterans Affairs secretary his predecessors sometimes lacked: credibility, experience and sound judgment. Even if it means challenging his bosses. Shinseki was nudged out as Army chief of staff in 2003 after testifying to Congress that the U.S. needed more troops in Iraq than Defense Secretary Donald Rumsfeld believed at the time. Shinseki was later proved correct. Now, Shinseki is faced with the task in the Obama administration of fixing a broken VA criticized for underestimating the resources needed to provide medical care and timely benefits to thousands of returning Iraq war veterans. "General Shinseki has a record of courage and honesty, and is a bold choice to lead the VA into the future," said Paul Rieckhoff, executive director of Iraq and Afghanistan Veterans of America. "He is a man that has always put patriotism ahead of politics, and is held in high regard by veterans of Iraq and Afghanistan." Shinseki, 66, the first Army four-star general of Japanese-American descent, was, like Obama, born and grew up in Hawaii. Formal announcement of his selection came at a Chicago news conference where he appeared with the president-elect. Shinseki graduated from the U.S. Military Academy in 1965. During his 38 years as a soldier, he received two Purple Hearts for life-threatening injuries in Vietnam after stepping on a land mine, which blew off one of his feet. 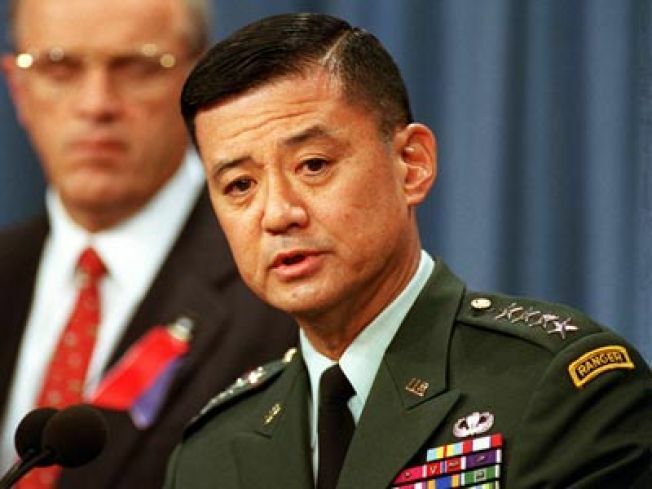 Shinseki became the Army's chief of staff in 1999. He testified to Congress in 2003 that it might take several hundred thousand U.S. troops to control Iraq after the invasion. Rumsfeld and his deputy, Paul Wolfowitz, belittled the estimate as off base, and Shinseki retired soon after. But Shinseki's words later proved prophetic after President George W. Bush in early 2007 announced a "surge" of additional troops to Iraq after miscalculating the numbers needed to stem sectarian violence. "We never had enough troops to begin with," said Sen. Lindsey Graham, R-S.C., as Bush announced plans for the troop increase. "A month or two ago we found out the Army is broken, and they agreed that General Shinseki was right." President-elect Barack Obama said Sunday he chose Shinseki for the VA post because the general predicted the U.S. would need more troops in Iraq. "I think that General Shinseki is exactly the right person who is going to be able to make sure that we honor our troops when they come home," Obama told NBC's "Meet the Press." At the VA, thousands of veterans currently endure six-month waits for disability benefits, despite promises by current VA Secretary James Peake and his predecessor, Jim Nicholson, to reduce delays. The department continues to work with the Pentagon to fix gaps in coordinating medical care of troops and veterans that contributed to the Walter Reed Army Medical Center scandal. And it is scrambling to upgrade government technology systems before new legislation providing for millions of dollars in new GI education benefits takes effect next August. On Sunday, Shinseki pledged to improve the VA.
"A word to my fellow veterans," Shinseki said at the press conference where Obama announced his nomination. "If confirmed, I will work each and every day to ensure that we are serving you was well as you have served us." He added, "We will always honor the sacrifices of those who have worn the uniform, and their loved ones."